There are two types of 'mui choy'. One is preserved with salt and the other is darker in color which is termed 'teem' - sweet. 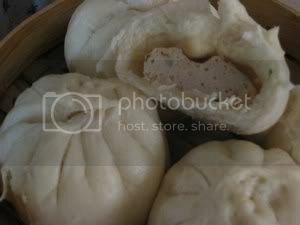 The sweet type is more 'mui' which is soft in cantonese, the softer the better, it will melt in the mouth. This dish could be presented in a fancier manner but for homecooked meals this is good eats. 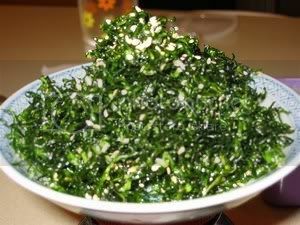 Remove leaves of mui choy from stem, wash and steep in water to remove excessive salt. Cut into 1 inch lengths. Cut belly pork into 1 inch cube and sprinkle with salt and pepper. Using the pressure cooker, heat 3 tbsp oil and fry the pork until slightly brown, then add the garlic and mui choy. Stir fry until fragrant, add the light soya sauce and enough water to cover the pork and mui choy. Return pot to heat and cook down the sauce. (sauce should not be too runny). Add in the dark soya sauce , sesame oil, cooking wine and adjust taste with sugar. 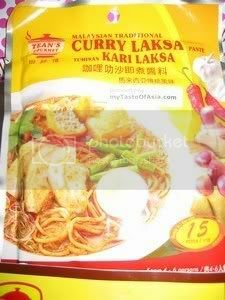 When we had this for breakfast, my daughter commented that she felt like she was in Malaysia. 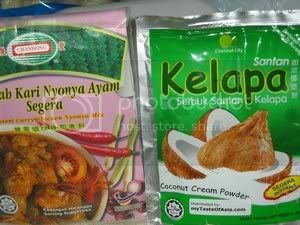 What made it so familiar with the breakfast nasi lemak of malaysia is the sambal. This sambal was straight from the bottle and it tasted like the 'macik's' , unlike my sambal which tends to be slightly sweet. 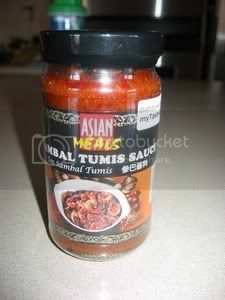 This bottle of asian meals sambal tumis sauce was sponsored by http:/mytasteofasia.com. Thank you, Ray, this is one sambal i would recommend to have in the pantry. 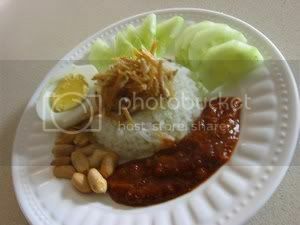 Refer here http://lilyng2000.blogspot.com/2005/06/nasi-lemak.html . The best part is you do not have to cook the sambal. 1. Rinse dried scallops and shrimp. Coarsely dice shrimp and break up scallops. 2. Cover scallops and shrimp with sake. Microwave one minute to cook and soften the mixture . (do not boil). 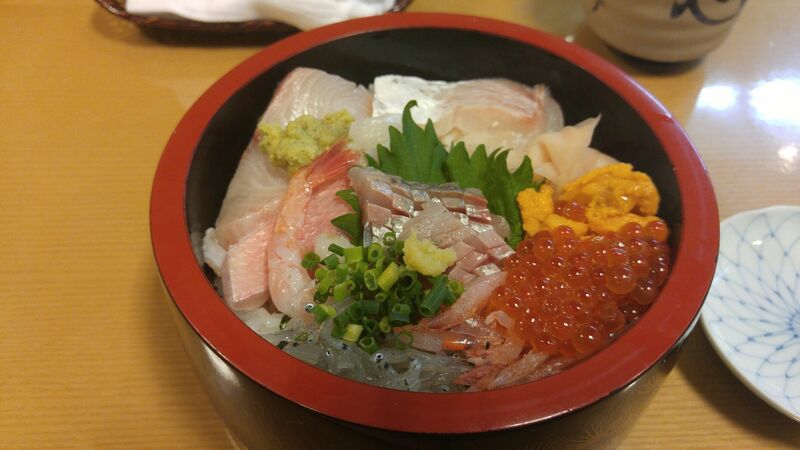 Let the sea foods cool off and leave in refrigerator for up to 1 week before making the sauce. 3. Finely chop the country ham in the food proccessor, set aside. 4. Drain liquid from the scallops and shrimp if there’s any left, they should absorbed all the sake by now. Using a food proccessor, chop the scallops and shrimp into smaller pieces . 5. Slightly cut up fresh chili and shallots. Put the vegetables and salt into a food processor and pulse few times to chop up the vegetables. 6. Heat a wok with lots of oil, Fry the ham, dried shrimp and scallops until crispy. Then stir fry the chili mixture until fragrant and shallots are thoroughly cooked. 7. Add seafood and ham mixture and red chilli pepper powder or paprika into the wok, add more oil if needed, and stir fry at medium low until the sauce bubbles. Add kosher salt for taste. Keep cooking for a minute or two. Remove from heat and let the sauce cool off. Optional: Add soy sauce and oyster sauce to the mixture if you wish, but the xo sauce will be a brown color instead of red. I did not give any measurement for the ingredients because I never measured when I cook; I just “eye ball” them. This is like making hot chili sauce, how much of each ingredient one puts into the sauce is personal preference. This cake was a craze in the 70's and it needed special plastic moulds for steaming. 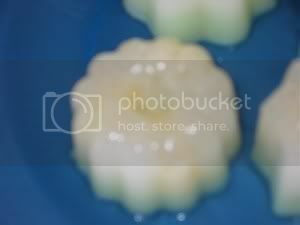 The moulds were not available in Malaysia then, i have to beg a singaporean friend to get me some. 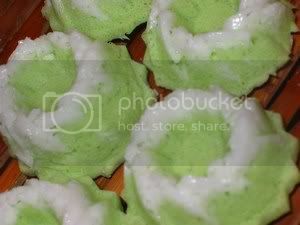 The name of this recipe is Apam Sri Ayu but Renee has named it Snowy Mountains. 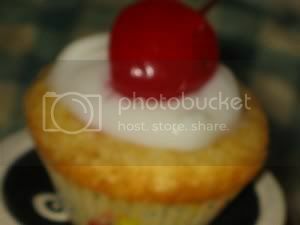 She told me to look out my bedroom window to look at the snowcapped mountain and that these cakes look like them. 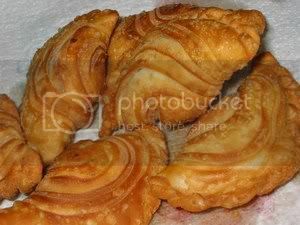 I have managed to buy these moulds when i was back in Malaysia and also found my old recipe book which has this recipe. 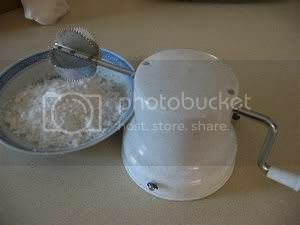 This recipe calls for freshly grated coconut and i was able to grate coconut in great speed with the coconut grater shown below. A friend was in India and he came home with one for me, knowing that i will treasure it. Mix coconut and water/coconut milk and microwave on high for 30 seconds. Add in salt and tapioca/corn flour and mix well. Grease moulds lightly and press some coconut into the base of a mould. Use another mould to push the coconut into the mould and press hard on it. Whisk all the ingredients for cake batter until thick and fluffy. Spoon mixture into prepared moulds and steam on very high heat for 8-10 mins. This is a soup but the hokkien has named it 'tea' probably because of the herbs. I will always cook this soup everytime it snows. it perfumes the house with it's fragrance of herbs snd how comforting it is to have a bowl of hot soup after being in the cold. Bak Kut Teh is always requested after a skiing trip without fail. 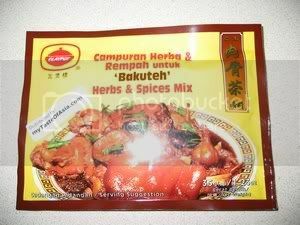 I would not be able to cook this soup if http://mytasteofasia.com had not send me a packet of Claypot brand to sample. Thanks. 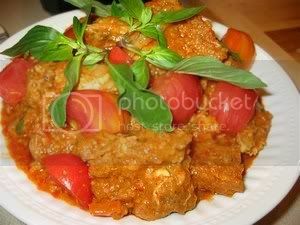 The herbs and spices are not too overpowering and it will enlighten anyone's palate be it asian or caucasian. Put spareribs in the pressure cooker and pour in enough water to cover the meat. Bring to the boil and cook until there is no more red blood oozing out of bones. Pour away the water and clean the bones thoroughly with cold water. Put back the cleaned spareribs, mushrooms, tofu pok, garlic, soya sauce, the herbs and spices mix bags and water. Cover the pressure cooker and cook for 15 minutes (at point of hissing). Release pressure by running pot under running cold water. Open lid and remove the oil from soup using a gravy separator. It is time to clean the pantry and i found a pack of PEBBLES and miniature marshmallows. So a hunting i go and found this recipe at Kraftfoods.com and found this recipe. Only 3 ingredients and papercups are needed. How easy can it be? MICROWAVE butter in 4-qt. microwaveable bowl on HIGH 45 sec. or until melted. Microwave 1-1/2 min. or until marshmallows are completely melted and mixture is well blended, stirring after 45 sec. SHAPE cereal mixture into tiny square shapes using moistened or greased hands. 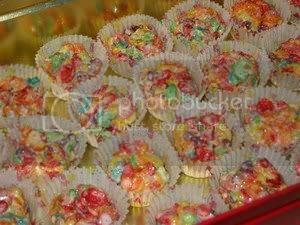 Place on paper cups or press into a foil lined square cake pan, cut into squares then place on paper cups. 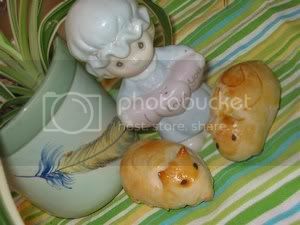 This is a very cute pastry but my bunnies look more like mice. Anyway, however they looked, they tasted delicious and fun to make. Prepare water and fat dough separately. Divide each dough into 18 equal portions. Wrap fat dough with water dough. 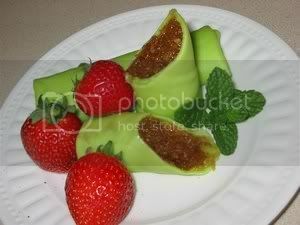 Flatten individual portions and roll up like a swiss roll. 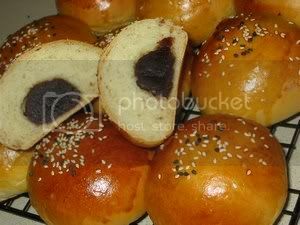 Flatten slightly and roll dough to form a bun. Mould bun into bowl shape. Mould into an oval shape. Snip V-shapes at one end for ears and other for tail. Brush with egg wash and use black sesame seeds for eyes. I have been going crazy trying to keep up with the overriped bananas. Lately the Lord and Princess decided they did not like bananas that much and the fridge is packed with bananas and they have to go fast and how else than to make muffins. 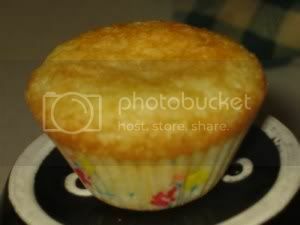 This recipe is so simple and easy and the muffins are simply delicious. 2. Mash the bananas well. Sift flour, baking powder, salt, cinnamon and nutmeg together in a large bowl, add caster sugar and stir through. 3.With a fork, beat together the eggs, vanilla extract, banana essence, oil and milk in a second bowl. Add the mashed banana and stir through. 4.Make a well in the centre of the dry ingredients and add the egg mixture, fold in with a biggest spatula (don't over mix) until it is a lumpy paste. 5. Set paper cases into the moulds, or grease the moulds well with a little extra oil or butter and using an icecream scoop, spoon in the mixture until almost full. Top each one with a walnut kernel if you like. 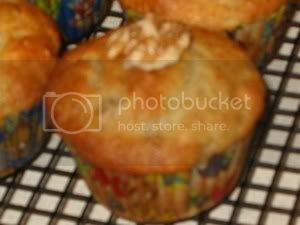 6.Bake for 20 to 25 minutes or until the muffins come away from the side of the pan when touched. Rest the muffin tray on a wire rack for five minutes then remove the muffins and leave on the rack for another five minutes before serving. When my cousin's family from Malaysia came for a visit, he bought 2 huge Thai Durians of which one was so delicious and the other is not quite. So, in the freezer it went for recycling. Made this cake ahead of the party and it froze very well. Picture was taken after it came out of oven and forgot to take a picture of the one that has been defrosted and drizzled with melted chocolate. The flavor was fine and ok for guests who have not tasted or do not like durian but for those who love durian, will suggest using the best delicious durian. Preheat oven to 350f. 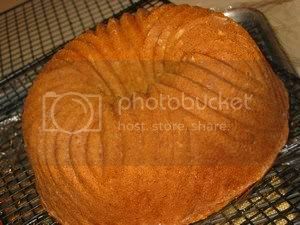 Grease the bundt pan and dust with flour. Cream margarine, sugar and salt until fluffy. Add durian and mix well to combine. Beat in eggs one at a time, followed by milk. Check for dropping consistency, if too stiff, add a tbsp of milk. Pour mixture into prepared bundt pan and bake for about 45 minutes. 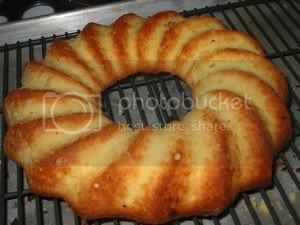 Cool in bundt pan and using the hot towel method, remove cake and let cool on rack. This is a wonderful snack and easy to cook but not so easy to get the correct type of raw peanuts in their shell to achieve those 'lum'/soft texture. 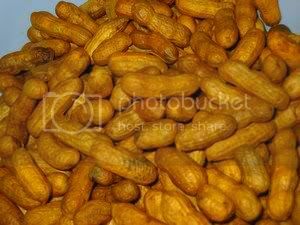 To my experience, if the peanut is bigger and has red skin, they are better for roasting or frying. For boiling, the peanut has to be smaller and with white skin. But, when the crave is there and you have no choice, any type will do. Once tender, add the sugar and simmer for another 10 mins. 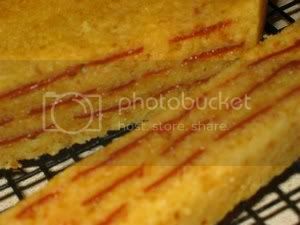 Taro is one of my favorite root vegetable and whenever i find a recipe that has taro, i will definitely give it a try. 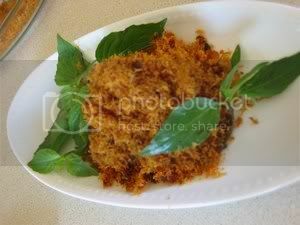 This dish will be on the table if i have taro and taro cake(woo tau koh) will be the next. When you run out of idea of what dishes to serve for dinner, this one pot meal is the best. Heat oil in a wok and lightly brown the shallots. Remove the shallot crisps and drain well. Leave aside. Add dried prawns and saute until fragrant. Add in chicken/pork and cook until chicken/pork is no more pink. Then add in taro and mushrooms. Add rice and seasoning. Stir-fry well. 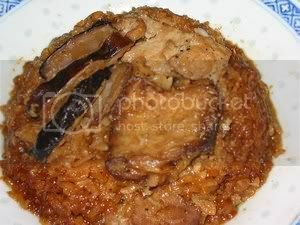 Dish rice mixture into an electric rice cooker. Add water and cook rice as usual. 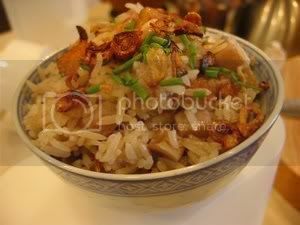 Stand rice in cooker for 10 to 15 minutes before dishing out to serve. 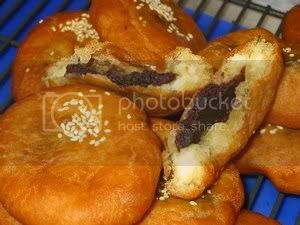 This recipe has been in my recipe collection for a long long time and since pau flour is not readily available here, have not made pau from scratch. I gave this recipe to a dear friend to try and she liked it. So, i decided to have a go at it . 1 ½ tsp instant yeast. Mix dough from method 1 with ingredients B. and knead until well blended. Cut into equal portions and roll all the portions into a very thin circle before wrapping in filling. Wrap the first circle and so forth. 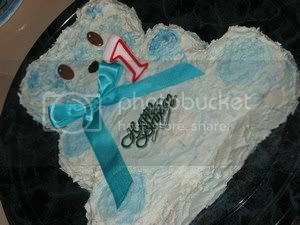 Alexander's First Birthday was 2 months ago and his cake is not even posted yet. Well, finally get to post it. Since he is not old enough to request, had to take the opportunity of making an esay way out kind of cake. 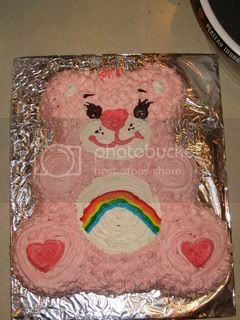 The cake was baked in the Teddy Bear mould and frosted with the sos buttercream. Renee, on the other hand, had her request - Cheer Bear from her Care Bears Collection. I have to thank Lucy for posting this recipe. 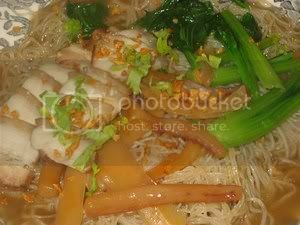 I could not make good rice flour fatt koh and have more or less given up. Renee is very sweet, she told me not to give up - she said ' Po Po, you can do it' So, i decided to try Lucy's recipe which is made with flour and had better results. In fact, for the taro, i am still wondering whether i have used the correct taro. I bought this vietnamese taro which is already mashed or grated????. Luckily it worked. The mashed sweet potato smiled better as i think i have found the correct cups and the amount of batter. The recipe has been altered. Mix the instant yeast with the coconut water and let it stand until it is frothy. Mix in the plain flour and stir till smooth. Rest for 30 mins. 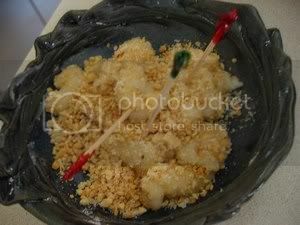 (1) Microwave the thick coconut milk and sugar for 1 minute. Warm will do, just to dissolve the sugar. Let it cool completely. 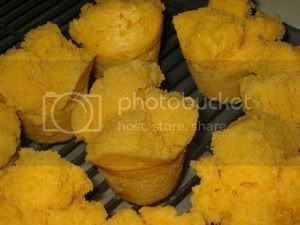 (2) Using the plunger blender, blend the boiled coconut milk with mashed yam or sweet potatoes and the whisked eggs. Sieve it. It will be thick but press through the sieve. 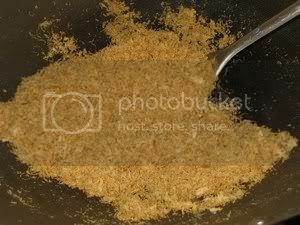 (3) Add in flour and stir till well mixed. 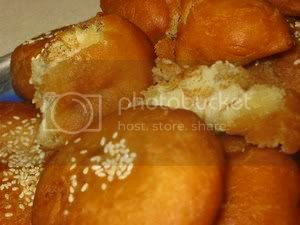 (4) Add in the fermented yeast dough and stir till well mixed. (5) Rest batter for 2 to 3 hours covered with cling wrap and a wet cloth until it has doubled in volume and frothy. 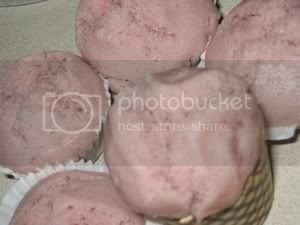 (6) Steam 4 small greased moulds, then using an ice cream Scoop, scoop in the batter till almost to the rim of cup. about 8/10. (7) Bring to a high boil as much water as the steamer can hold and add in 2 tbsp of vinegar. Steam on the highest heat available for about 15 mins with a cloth covered lid till cooked. 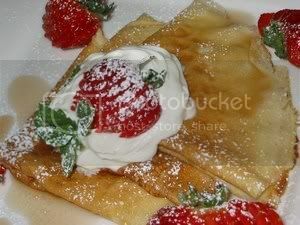 (8) Repeat until all the batter is finished. If the koh does not smile or split open, Lucy's suggestion is to dip a spatula into a small bowl of cornoil and then make a cross on top. 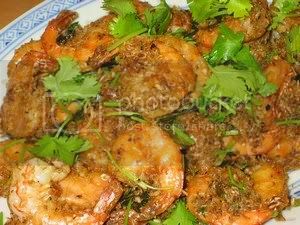 My preference of prawns with heads-on for this recipe is desirable as it is will enhance the flavor as well as better presentation . Cooking this dish was at impluse and found prawns without heads in the freezer. If only i had red pepper for garnishing, then this picture would be more appealing. Anyway, with or without the red pepper, this dish is delicious. Winnie and Tricia, hope the both of you like this version. Dress the prawns by snipping off the shape points from the head and remove the sacs and intestines from the back. Heat enough oil to fry the prawns until 3/4 cooked. Heat margarine, add in coconut/egg yolk, then chilly padi and curry leaves. Fry until fragrant. Add in the prawns and seasonings. Lastly, add in the evaporated milk and fry for another minute or so. 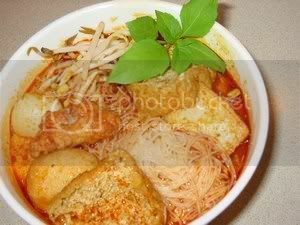 How can i miss posting this classic of all classics hawker food in Malaysia. The best Char Kway Teow is the old fashion ones which is darker and only egg added besides the other necessary ingredients. My preference would be fried without the egg cos when egg is added, the temperature of the noodles drops and i like the noodles to be piping hot and with 'sung hum(uncooked cockles). This luxury of cockles is not possible here, i have seen frozen ones but i certainly will not buy them. 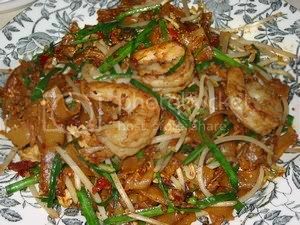 The Penang style is what the hawkers are dishing out and more acceptable as the ingredients of chinese Lap Cheong and Prawns are added. Crab meat can also be added of which a store in Penang does and became the store that served the best Char Kway Teow. To me, best is fried with lard and a huge spoonful of goody that is the reminence of the fried lard. it might not be too healthy but once in a while??????? Heat wok with 3 tbsp oil until hot and fry Chinese sausages until fragrant, then add l tsp chopped garlic . Add about prawns and fry until cooked. Push all the fried ingredients to one side and add in kway teow. Stir-fry the kway teow and add seasoning and sprinkle with a little water to mix. Spread all the ingredients around the kuali and create an empty space in the centre, then crack an egg into it and add a little more oil. Cover the egg with all the ingredients and stir-fry evenly. Add cockles if desired and mix in a handful of beansprouts and the chives. Do not overcook. Remove the dish to a plate and serve hot. Lam yee is the variety of preserved bean curd which is made with fermented red rice and its nickname is "Chinese cheese. 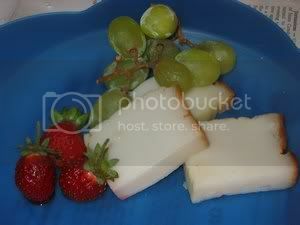 "as it has a pungent aroma similar to strong cheese. To me, cos i am chinese, finds this pungent aroma not offensive compared to strong cheese but the taste is very salty and has to be used for marinating or making sauces. 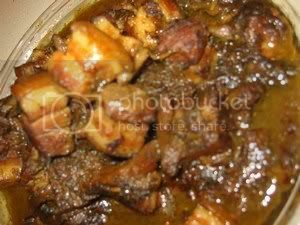 Parboil spareribs in boiling water with 1 tablespoon of wine for 10 minutes, remove and pat dry. Mix the marinate and pour into the spareribs. Leave in fridge to marinade for at least 1 hour. Heat enough oil for deep frying. 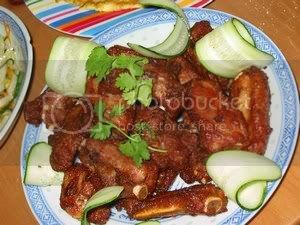 Deep fry the spareribs in moderately hot oil until ribs are crispy and brown. This is one of the classic of sweetened soup. Pearl/Sweet Barley is supposed to be cooling and it has many good properties that do your body good. When you have bladder problem, drinking plain barley water will help bladder improvement fast. This sweetened soup is cooked when the summer is hot, hot like right now. Denver was 103 f yesterday. Gingko nuts are optional as they are readily available here. 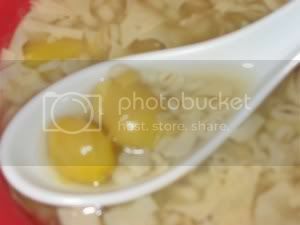 I use the canned gingko nuts which is very convenient as the raw nuts need thorough preparation. 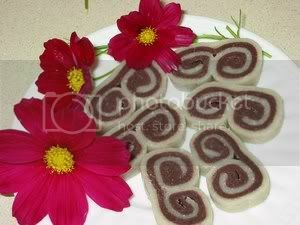 Soak dried bean curd sheet in cold water for a while. It should be very soft and if the sheet is not soft, add a pinch(yes, a very tiny pinch of bicarbonate of soda to the cold water) and leave it to soften the bean curd. Drain. 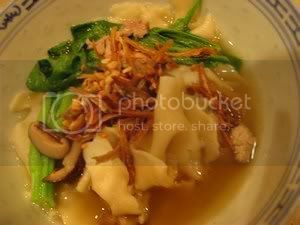 Bring back soup to the boil, add the rest of the water, gingko nuts and sugar. When sugar dissolves, turn off heat as soon as the soup comes to high boil. Stir in the egg/egg white and keep stirring until it is cooked. 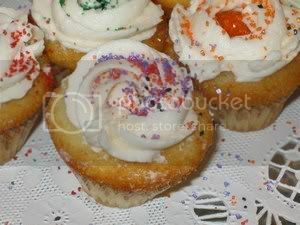 Thank you Jolibakery for sharing this recipe. This recipe is easy and very delicious. I used the pressure cooker which cuts the cooking time by a quarter and added more wine for the marinate. 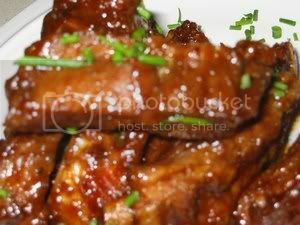 Marinate the spareribs with ingredients (A) for 2 hours. Heat oil in a pressure cooker. Fry ginger, spring onion and garlic until fragrant. Add spareribs and the remaining seasoning. Close the lid of the pressure cooker and bring pressure to high. Reduce heat and pressurise for about 15 minutes. Turn of heat and release the pressure before opening lid. The meat should be tender. 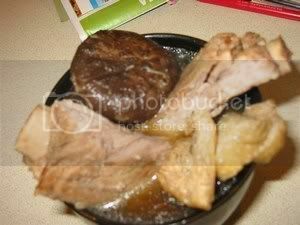 Cook meat uncovered until gravy is thick, almost dries up.. The most dependable dish when i have unexpected guests for dinner. It is elegant and presentable and easily dished out especially when time is not with you. If the guests are asians, i would love to cook 'Hainanese Chicken Rice' to go with it otherwise baked/mashed potatoes delight other guests. Having the correct oven saved my repertoire for a perfect roast, just click AUTOROAST. Salt and pepper the inside of chicken and sprinkle with spice rub. Cream together margarine/butter and garlic. 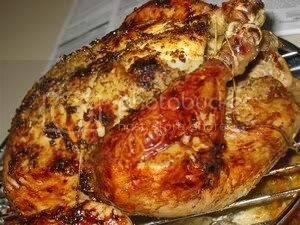 Turn chicken breast side up and work your fingers under the skin at the openings on each side of the breast. Continue into thigh and leg and make the skin as smooth as possible. Using fingers, spread margarine/butter mixture evenly under skin. 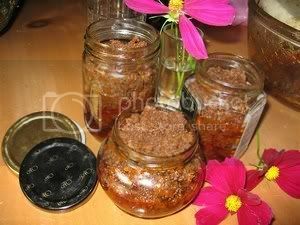 Rub the skin with lemon juice and sprinkle with more spice rub. Place chicken, breast side up on rack and truss the legs. Now comes the best part. 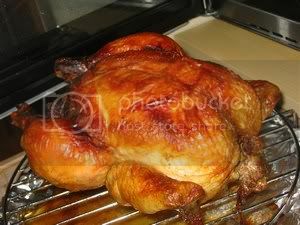 Follow directions in AUTO ROAST and when oven beeps Chicken is ready.